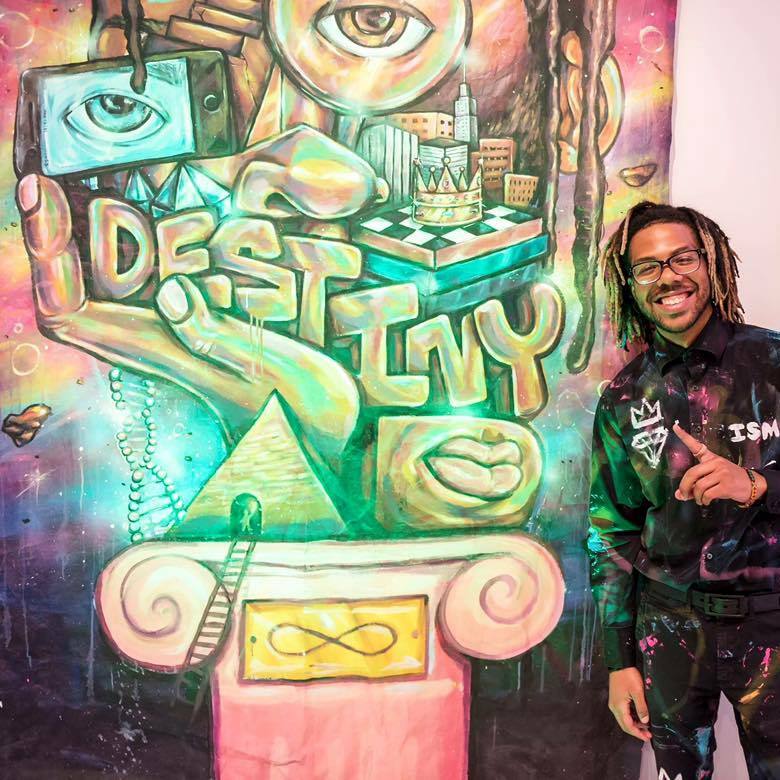 Painter, illustrator and muralist Terrance Vann is guest-curating an exhibition of more than 50 pieces of contemporary and accessible street art by more than two dozen artists of note, both locally and beyond, for Delaware College of Art and Design (DCAD) in August. Local + Famous: A Celebration of Homegrown Talent will fill DCAD’s Toni & Stuart B. Young Gallery from August 3 to 19. Vann (also known by his Instagram handle @Terranceism) will co-host the show with fellow Wilmington artist Alim Smith (known as @yesterdaynite on Instagram). Smith is best known for his iconic “Memes” exhibition, which went viral online and attracted national press attention. Together Vann and Smith are known as The Color Brothers, and the works they’re bringing to DCAD promise to be vibrant. An example of this will be Vann’s own vividly colorful work, which Pitts has long admired and says “aims to portray the surreal world of our imaginations.” Vann received a 2017 Delaware Division of the Arts Emerging Artists Fellowship and has exhibited pieces nationwide. He is thrilled to have been asked to curate such a show at DCAD. Among the artists exhibiting alongside Vann and Smith will be Shanina Dionna, who was a winner in Kasseem “Swizz Beatz” Dean’s international “The Dean Collection 20 St(art)ups” or TDC20 competition. Joining their work will be pieces from the area’s veterans of the art world, including Rick Rockroth, Eunice LaFate, K.O. Simms and many more. Local galleries and tattoo shops also will be represented. Local + Famous will open with a reception from 5:00 to 10:00pm on Friday, August 3, in conjunction with Art Loop Wilmington. Van Gogh Vodka, liquor sponsor for the event, will be 10:00am to 6:00pm Mondays, Tuesdays, Thursdays and Fridays; 10:00am to 7:00pm Wednesdays; and 10:00am to 4:00pm Saturdays and Sundays. For a full list of Local + Famous artists or for other information about the exhibition, contact DCAD communications director Susan Coulby at 302.622.8000 (office), 302.983.5710 (cell) or scoulby@dcad.edu.